Are you looking to enjoy a romantic meal in Washington, DC this Valentine’s Day? Here are some restaurants that offer specials that are sure to make for a wonderful evening for you and your sweetie. Make your reservation ahead of time to be sure to get a nice table. Keep in mind, all fixed prices do not include tax and gratuity. Details are subject to change; please confirm pricing with the restaurant. 701 Pennsylvania Avenue, NW, Washington DC. (202) 393-0701. Entrée standouts include Shenandoah Lamb Rack and Loin with pomegranate, celery root, and trumpet royal mushroom; Black Bass with malpeque oyster risotto, Champagne and caviar sauce; House Made Garganelli with ricotta and shaved black truffles as well as Pheasant with potato hash, blue cheese and beet sauce. Four course menu for $85/person with live jazz available throughout the evening. Valet parking will be available for $8/car. 3000 K Street NW, in Georgetown’s Washington Harbour (202) 333-4422. Three multi-course Valentine’s Day Menus are available, each designed around a shareable entrée sized for two. Diners may select the $22 per/person option: Vegetable Spring Roll, Pad Thai-for-Two or a Small Crispy Flounder, and a Strawberry Cream Profiterole as well as two glasses of house wine. Bangkok Joe’s Valentine’s Day menu will be priced: $22, $32, $42, depending on entrée choice. Park Hyatt Washington, 24 and M Streets, NW. (202) 419-6755. A special four-course menu that is priced at $70 per person. The menu begins with Espelette Pepper Crusted Scallops with Winter Citrus, Endive and Smoked Trout Roe followed by Butter Poached Maine Lobster with Cardamom, Clementines and Hearts of Palm and Beef Wellington Reinvented with Seared Foie Gras, Black Trumpet Mushrooms, Pommes Maxim and Truffle Jus. The dinner concludes with a Warm Chocolate Fondant with Rosemary Cream and Brandied Cerries. A complete a la carte menu will also be available with prices ranging from $11 to $17 for appetizers and $16 to $36 for entrées. Fours Season Hotel, 2800 Pennsylvania Avenue, NW (202) 944-2026. Valentine’s Day menu features Maine lobster risotto, Chateaubriand for two and Warm milk chocolate fondant, $199 per couple. Guest will also have the opportunity to purchase a gift that will be wrapped, delivered and waiting for that special someone at the time of reservation. 1500 New Hampshire Avenue NW, Washington, DC. (202) 797-0169. Enjoy a three-course prix-fixe menu with a sensual dessert for two and a complimentary glass of sparkling wine. The restaurant will have a caricaturist available for couples who would like to capture the evening in a cartoon portrait together and each couple will be presented with a rose and chocolates at the end of the evening to take home and enjoy. $90 per couple. Renaissance Mayflower Hotel, 1127 Connecticut Avenue, NW, Washington, DC (202) 347-3000. 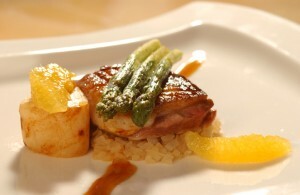 A special Valentine’s Day menu is available February 11-14, 2011. Four-course prix-fixe menu. Each couple will receive a long stem rose from the hotel’s flower shop. $72 per person. Mandarin Oriental, 1330 Maryland Avenue, SW Washington DC. Regular three-course prix fixe menu available on February 12-13, 2010. $80 per person. They will also have a special six-course tasting menu, February 12-14, $150 per person with an additional $100 for wine pairings. The restaurant’s lounge will also be transformed into a “Sin Den” with a private cabana-style setting with mood lighting and sheer drapes, providing a more intimate experience. $350 per couple. 801A 9th Street, NW Washington DC. (202) 408-1600. A ‘Golden Age of Romance’ menu with a Cuban twist this Valentine’s Day. Inspired by Cuban’s golden age of the 1940s, the menu is available February 11-14th. Cchoose two apetitivos, two platos and a duo of desserts designed to share for $78 per couple. Standout dishes include Ostras Julio Lobos: Oysters Baked in a Cazuelita with Spinach, Goat Cheese, Scallions and Aguardiente Sauce; Palometa en Bolsa: Fresh boneless Pompano Fillet, Shrimp Crabmeat in Parchment Paperwith Mango Beurre Blanc, as well as Langosta Thermidor: Lobster Tails Gratin, in its shell, with Butter, Cream, Gruyere Cheese and Mushrooms withForbidden Black Rice and a Lobster Sauce. For dessert, enjoy Isla Flotante: Vanilla Meringue Floating on a Natilla Custard Sauce with Caramel and Toasted Almonds or Crepas con Naranja: Crepes Sautéed in a Butter, Orange Juice and Gran Marnier Sauce with a Passion Fruit Chantilly Cream. 1624 Q Street, NW, Washington DC. 202-462-HANK (4265) Enjoy a special lovers sampler this Valentine’s Day. $32 per person, or 60 per couple. The sampler includes a half-dozen freshly shucked oysters paired with two one-and-a-half pound lobsters. For an additional $30, enjoy a half bottle of Gardet Champagne for the table. Hank’s Valentine’s Day menu is available exclusively Monday and Tuesday evenings throughout the month of February at the DC location only. W Hotel, 515 15th Street, NW Washington DC (202) 661-2440. $90 per person, $135 with wine pairings. The menu includes highlights such as Warm Kumamoto Oysters with Creamed Basil; Steamed Maine Lobster with Japanese Turnips, Bok Choy and Yuzu Vinaigrette; and Warm Chocolate Cake with Caramel Ice Cream. The regular dinner menu will also be available. 2404 Wisconsin Ave NW Washington DC. (202) 333-3877. Three course menu features dishes such as Cumin Scented Butternut Squash Soup, Fennel & Arugula Salad Oranges, Kalamata Olives, Meyer Lemon Vinaigrette, 6 oz Angus Fillet served with Whipped Yukon Gold Potatoes, Crispy Spinach Classic Bouillabaisse Maya Shrimp, Rockfish, Cherrystone Clams in a Spiced Tomato Seafood Broth, Molten Chocolate Cake Topped with Whipped Creme Fraiche & Toffee Brittle, Chocolate Dipped Strawberries with Complimentary Champagne. Available February 13-14. $65.00 per person. 1401 K St. NW Washington DC. (202) 789-2800. A 4-course aphrodisiac menu begins by teasing guests between Blue Point Oysters and Tasmanian Sweet CrabCeviche. Then caresses the palette with grilled asparagus and wild mushrooms. Followed by the sumptuous selections of pan seared Turbot, Filet Mignon & Figs and Mediterranean Bronzino. Lastly, decadent warm chocolate cake or passion fruit créme brulee. Valentine offering available February 13-14. $55 per person. 2020 O Street NW Washington, DC (202) 496-2020. Explore over 100 rooms, 32 secret doors, 14 kitchens and 2 wine cellars while you eat, drink and fall in love all over again! Happy “H”ours – $30/person, includes chocolate fountain and one complimentary glass of champagne, cash bar. Sit-Down Dinner – $95/person, Four course meal includes caviar bar, chocolate fountain and dessert buffet extravaganza. Online reservations are required. 1825 14th Street, NW, Washington, DC. (202) 328-1414. A five-course Valentine’s Day menu highlights the restaurant’s signature Latin-Asian fare. The menu includes an amuse, a choice of six plates, dessert to share and a bottle of Gruet Blanc de Noir or Gruet Rose. Specials include Grilled Lobster with mushroom tempura, truffle custard tart and salsa verde; Charred Bison Tataki served with plantain croutons, chipotle mayo, dried shrimp & green papaya salad; Grilled Smoked Beef Brisket served with Chinese sausage, braised daikon, bone marrow custard, rice cakes and a red miso guajillo chile broth as well as Papas Rellenos served with truffle custard, winter vegetable ragout and sauce pipian. $120 per couple, same menu available on Feb. 13 for $105 per couple. Enjoy the romance of a dinner/brunch cruise along the Potomac River with Odyssey this Valentine’s Day and see spectacular views of Washington DC’s monuments. From Washington, DC February 12-14, 2012. Includes fine dining, glass of champagne, live entertainment and dancing. Prices: Dinner: $129.90, Sun. Brunch $74.90. Gaylord National Resort, National Harbor, MD. (301) 965-2000. Three-course dinner paired with a bottle of seductive Rosa Regale sparkling red wine. Dinner begins with a choice of either soup or salad, followed by the main course – a perfectly seared premium Black Angus Filet Mignon or sautéed Florida Red Grouper – accompanied by a choice of one of our signature side dishes. $159 per couple. Available Feb. 14 and every Fri, Sat, Sun during the month of February. 800 Connecticut Avenue, NW, Washington DC (202) 463-8700. A three-course menu, $85 per person. includes dishes such as Crudo of Maine Sea Scallops with pickled Rose, Celery and Black Truffle; Spaghetti Flavored with Jalapeno and Smoked Uni Carbonara; American Wagya Rib Eye with Carrots, Coffee and Cardamom, as well as Japanese Red Snapper with Reuben Sandwich Garnishes. For dessert, a Vanilla Almond Ice Cream Bon Bon is just one of the many options to choose from. 401 7th St. NW (202) 628-1005. A la carte menu or a special menu of Valentine’s Day antojitos ranging in price from $7 to $11. Specials include romantic savory dishes including Ostiones Pimentados Estilio Tampico, six oysters on the half shell with Tampico style black pepper sauce; Ceviche de kampachi de los enamorados, ceviche of Kona kampachi with passion fruit, rose and vanilla and Panceta de Puerco al Pastor con Tequila Reposado, slow roasted house cured pork belly served with a fragrant sauce of guajillo chile and pineapple. 633 D Street, NW, Washington DC. (202) 637-1222. Enjoy a four-course Valentines Day menu, $85 per person. Wine pairings for an additional $45 per person. A three-course $55 per person menu will also be available in the 16-seat lounge area. Valet parking is available for $8. 7121 Bethesda Lane, Bethesda, MD. (301) 656-5515. Menu highlights include Sea Scallops with oxtail risotto, harissa and salsa verde; Terrine of Game and Foie Gras with quince relish, coffee, pepper and toasts; Lobster Hot Pot with a Maine lobster broth, egg noodles and condiments as well as Filet Mignon with sautéed foie gras and truffle sauce. Live Jazz music courtesy of George Oakley Trio from 6 PM to 9 PM, followed by a performance by the Latin group Trio Caliente from 9 p.m. to 11 p.m. on this romantic night. $59 per person. 1068 31 St NW, Washington DC (202) 342-7414. Four-course menu, champagne toast, strolling guitarist and a fresh rose for the ladies, $60 per person. Guests can also cozy up to one of Ristorante Piccolo’s three fireplaces on Sunday February 12, 2012 for a special brunch. The John F. Kennedy Center for the Performing Arts, 2700 F Street, NW. (202) 416-8555. Valentine’s Day menu features a prix-fixe, three-course dinner designed to awaken the senses, with dishes like Butternut Squash Apple Cider Bisque with candied pecans, maple crème fraiche and sage and Braised Lamb Shank with grilled rapini, toasted pine nuts and citrus gremolata. $50 per person. 575 Pennsylvania Ave. NW (202) 637-6100. Special five-course tasting menu on Valentine’s Day with a wide range of options within each course. The menu includes amuse of Chilled Kumamoto oyster with black truffle mignonette, “Fire & Ice” maki rolls, whole steamed black bass with individual sauces- Thai-style chili and yuzu ponzu, American-style Kobe rib eye and Whole Maine lobster. $125 per person and $180 per person with wine pairings. February 11 and 14, 2012. Valentine’s Dinner and Lunch Cruises. Dinner $99.90, Lunch $49.90 per person. Wine and dine your valentine and enjoy a deluxe buffet, live entertainment and beautiful views of the Potomac River. 1350 I St. NW (202) 289-8843. Valentine’s Day Tuscan Escape: A four-course menu, champagne toast, fresh rose for the ladies, and romantic piano accompaniment, $65 per person. 701 9th St. NW (202) 638-0800. Valentine’s Day specials include Stone Oven Oysters with pork belly, red peppers, caper and sultan; Roasted Duck Santorini with liquorices scented honey and red lentil stew; Lobster Makaronada with fresh elbow spinach pasta lobster mushrooms and mizithra cheese and Urfa Pepper Rib Eye marinated in yogurt and spiced roasted baby onions. 781 7th Street, NW. (202) 393-2929. Enjoy a four-course Latin Asian sharing menu February 12-14. Highlights include Creamy Lobster Soup served with Lobster Dumplings, Truffle Crema Fresca, and Kaffir Lime; Pekin Duck Tacos served with Foie Gras, Curried Apple, Flour Tortillas and an Orange Coriander Sauce; Miso Grilled Beef Tenderloin served with Truffles, Crema Fresca Mashed Potato, Scallions and Sweet Chile Sauce; Grilled Giant Tiger Prawns served with Warm Chile Serrano, Corn Salsa, Teriyaki and Jasmine Rice as well as a romantic Chocolate Tasting for Two with Warm Chocolate Tart, Mezcal Chocolate Truffles, and Dipped Strawberries. $60 per person. 1155 14th Street NW, Washington, DC (202) 379-4366. Four-course, prix fixe Valentine’s Day offering, featuring global Asian cuisine. $75 per person The menu features standouts such as Beausoleil Oysters with Caviar, Dill, Seaweed and Sudashi; Red Snapper with Rose Essence, Beet Root, Balsamic andFennel, as well as Creek Stone Farm Short Ribs with Chicory, Truffles and Horseradish. For the perfect ending, guests will enjoy a variety of House-made Truffles. 800 F Street, NW Washington DC. (202) 654-0999. A four-course menu begins with Lemon-Chive Buckwheat Pancakes served with American Caviar, Mache and Crème Fraiche followed by Oyster Sliders served on Brioche with Fennel Cress, Citrus Slaw and Plum Aioli and Green Hill Farms Lamb served with Goat Cheese Polenta Cake, Smokey Braised Greens and Fig Jus. For the perfect ending, a Bittersweet Chocolate “Bomb” served with Blood Orange Marmalade and Sauce completes this romantic feast.